Originally from Silver Spring, MD, Rebecca is a Computer Science major and an Undergraduate Research Assistant at the UMBC MAPLE (Multi-Agent Planning and Learning) Lab. When did you become interested in Computer Science? High School. What area of Computer Science interests you the most? (Truth be told) Job Security; Feeling like a strong independent woman "fighting" for her right to be a Computer Scientist. What is your dream job? My dream job is being a dancer or a chorus teacher (my retirement plan). My CS dream job is one where I'd be able to write programs that will make a difference in the world (either in health, education, etc.) and be able to interact with people all over the world. Hobbies? I like to sing when no one's around to hear, dance like no one's watching, and draw. What is your favorite professor/course and why? Professor Brian Dunnigan – English 100. Off-beat class, profound wisdom. He's a cool cat. Pro Tip: You get to read graphic novels in his class (my class read V for Vendetta, which is my favorite). What is the best part about being a CWIT Affiliate? Being exposed to all the opportunities around me. I've had a narrow path set by my family upon graduating. Thanks to CWIT, GraceHopper, and my bosses, I've learned I can do anything with my Computer Science major. Not just sitting in a cubicle, but having jobs that will allow me to travel and interact with other passionate, fun-loving people. Are you part of any on-campus clubs, organizations, teams, or labs? I'm affiliated with UMBC's Ultimate Frisbee club, Rock Climbing club, Swing Dance club, and UMBC's CWIT (Center for Women in Technology). Have you done any undergraduate research? I'm an Undergraduate Research Assistant at the UMBC MAPLE (Multi-Agent Planning and Learning) Lab under CE21 (Computing Education for the 21st Century) and CS4HS (Computer Science for High School) projects. We are a planning project with the goal of increasing high school computer science expertise and statewide support in Maryland for computing education. I'm responsible for all aspects of event management, including site selection, contract negotiation, proposal planning, transportation arrangements, housing, and production of meeting materials for professional CS workshops, meetings, and industry dinners. What advice would you give to incoming students? Procrastination is death. Everyone will tell you this so take the advice: "Start your projects early." Leave the last minute panic to us oldies. Think about it: Finish a project early, eliminate stress, and go out and enjoy your life. You'll definitely be a happier person. What advice would you give to other females entering the field? You are not alone. Really. Being an affiliate for CWIT and an undergraduate research assistant, I've been able to network with many students and professors. There are professors that truly want to push you on the path of greatness. There are students that share the same mindset and know your pain (or at least understand them). Befriend them. If you see me, say "Hi." I'll be your friend. 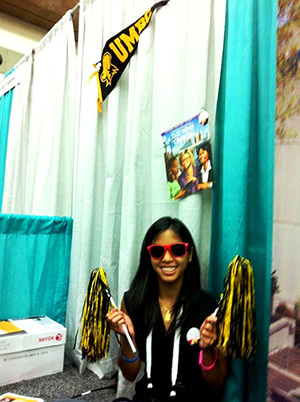 What is the best part about campus life at UMBC? The quaint serenity of living on a moderately small community campus. UMBC is my home, my work place, and my school. My friends are my neighbors (mainly within walking distance), my coworkers are my colleagues, classmates, and friends, and my professors are my mentors, advisers, and bosses. I have the freedom to do what I want when I want all in one little loop. Props to Campus Police and UMBC's general vicinity for making campus feel safe and cozy. What is your favorite spot on campus? I would tell you but that would spoil its serenity.